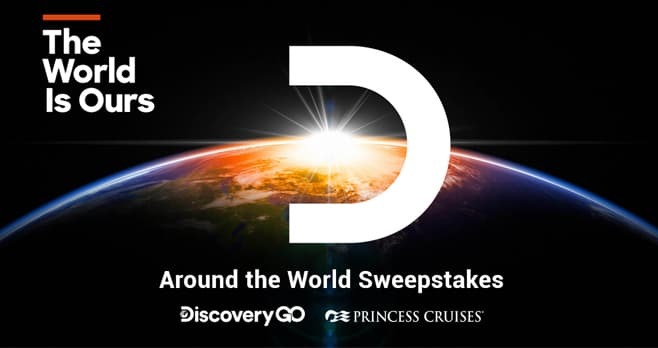 Discovery Around the World Sweepstakes (Discovery Go Code): Download the Discovery Go App on your favorite device and watch Discovery shows for the daily Around the World Sweepstakes Code and a chance to win a trip around the world. The Discovery Trip Around the World Sweepstakes is open only to legal residents of the 48 contiguous United States and D.C. who are 21 years of age or older as of the Promotion start date. The Sweepstakes begins at 9:00 a.m. ET on April 1, 2019 until 11:30 p.m. ET on April 15, 2019. There is a limit of one (1) entry, per valid email address, per eligible person, per day, regardless of method of entry, for a total of fifteen (15) entries. The grand prize consists of a forty-nine (49) day trip around the world. Visit discovery.com/trip-around-the-world-giveaway to enter and see Official Rules for details. Thank you for publishing the code word. I do not get the Discovery Channel and had difficulty with the online version. But, I would love to win this trip, it would be the Adventure of a lifetime!